Major T.P. Gray is buried in the graveyard of Dalston Church in North Cumbria. His grave is marked by a single, slightly damaged white stone with his name, rank and regimental insignia carved into it. Surrounded by dark coloured headstones the bright white Commonwealth War Grave memorial stands as a beacon in the graveyard, just like the Major possibly did for the men under his command. Little is known about Major Thomas Patrick Gray and why he is buried in the church in north Cumbria. 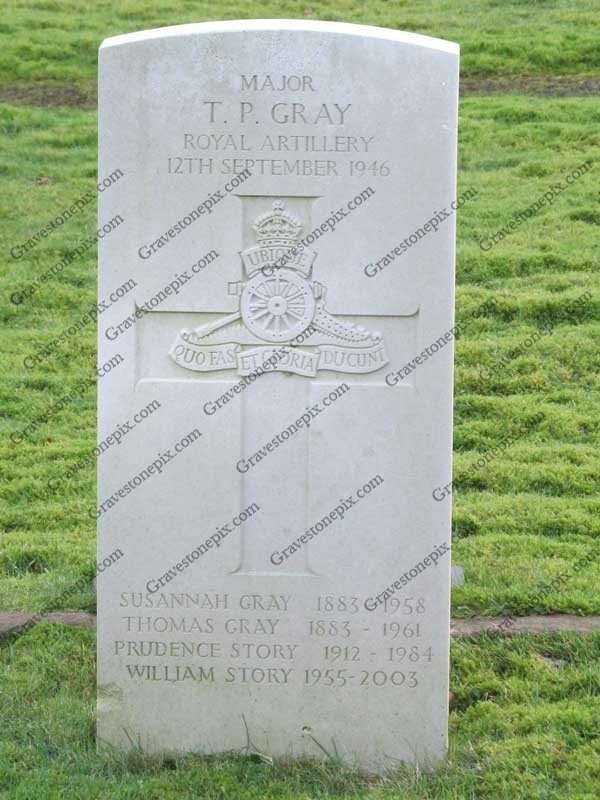 Except that he died on the 12 September 1946 and that he was a major in the Royal Artillery. He is buried in ward 5, sec. C, grave number 60. His service number, according to the Commonwealth War Graves Commission, was 94441. It is thought that he may have been the Judge Advocate General for a time. However, at this stage this is not proven. Do you know any more about Major Gray ? Let us know via the comments area below or via the contact us page.